Odyssey Photo Deal for the Senior Bachelor Group- Look, the first one! Special Senior Bachelor deal for embarkation photos at the Odyssey, Friday, September 30th! Most of you know that when you embark on cruise ships someone is there taking your photo which you can buy later. The Odyssey does the same thing with a company called Sharpshooters. However, their photo packages for Friday evening cruises usually cost $20. We've talked with them and they have agreed to offer embarkation photos for the Senior Bachelor group at a special rate of $10!! We'll have Richard there to be in the photo with you and your friends (if you want!) In order to do this we have to be assembled at the Odyssey together just before 7:00PM on Friday, September 30th. We'll have the information on the Agenda but Friday evening will look like this. The meetings end at the hotel around 5:45 PM. Then we all get to the Navy Pier as close to 6:15 PM as possible. (It's a 10 minute cab ride at around $8 but four can share for that price- or it's a 25 minute walk.) They have a live webcam at the entrance (check it out- click here) and I want us to assemble and wave to our online friends (I only hope their internet servers can handle it)! Then we'll go into the Navy Pier and play for a little while. On the way to the Odyssey, there is a staircase right across from the "Salty Dog" boat. This is a great spot for a group shot! Then we'll finish our stroll to the embarkation point of the Odyssey for our individual embarkation photos and off we go!! Richard flew to Chicago yesterday just to check this out. How do you like the test photo with Pam!? Man, what I wouldn't give to get him in an outfit like that for the Cruise!! Gather your friends, Chicagoans (and early arrivals), and watch the Senior Bachelor interviewed LIVE on Fox Chicago, Channel 32 next Thursday morning right after 8:00AM!!! The reservations for the Palmer House Hilton Hotel and all the events are going extremely well. Heading for a sell-out for everything. Please, please make your reservations as soon as possible- we don't want you to miss out on all the FUN! There was a last minute rush for rooms at Manhattan Beach and some had to be put up at other hotels. While you still may get a room at the Palmer House, they would only set aside a certain number of rooms at the speical Senior Bachelor rate. Palmer House Hilton: 1-877-865-5321-- ask for the Senior Bachelor Rate. "La Cantina" Restaurant, Thursday, Sept 29 Early Arrival Dinner: Please call 312-332-7005 and ask to talk to "Mina" or "Gina" (that's no joke!) They are the only ones with whom you can leave your RSVP request. Odyssey Dinner Cruise, Friday, September 30: Call 312-396-2227 and ask for Rob. Have your credit card ready. Be sure to tell him you are calling for the Senior Bachelor Cruise to get the special $80 TOTAL rate. Dinner for Saturday, October 1 is still being worked on but plan for a 7-ish start and the "Crazy Hat" Party and other fun activities back at the hotel starting around 9-ish. Perfect Match Click here to find your Perfect Match! ... and more we will list later. Fireworks on the Dinner Cruise!! Well, of course, you all want to see fireworks when you are talking with the Senior Bachelor, but we are going to have REAL FIREWORKS!! They'll be blasting off the Navy Pier around 9:45PM on our return to the pier during our Dinner Cruise on the Odyssey. Now, how cool is that! Call Rob at Odyssey Cruises 312-396-2227 to make your reservation for the Dinner Cruise, Friday, September 30. 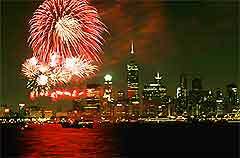 Embark at 7:00PM from the Navy Pier, return at 11:00 PM. CHICAGO- Dinner for Thursday, September 29 for EARLY ARRIVALS! We dine at 7:30 PM so we'll assemble in the Palmer House Hilton lobby at around 7:15 PM for the short trek there. Dress should be dressy casual. You know Richard, Umberto and I will have our somewhat dressy, beach-casual threads on! - No host, cash bar. Special RSVP Instructions: Please call 312-332-7005 and ask to talk to "Mina" or "Gina" (that's no joke!) They are the only ones with whom you can leave your RSVP request. Tell them you want to RSVP for the Senior Bachelor dinner. This is very important so they can get an accurate dinner count. They will not take your credit card at this time. The restaurant is limited to 120 diners so, please, make your reservations early. As we have mentioned before, Chicago is a very busy place this time of year and Mina has been very gracious to set things up this way so, please follow these RSVP instructions to ensure a place at dinner. Reservations will be cut off on Wednesday, September 28th. The hotel early bookings at the Palmer House indicate that many of you are coming in on Thursday and we do not know how many local Ladies will join us so please call soon. If you go to voice mail, clearly state your name and phone number so Mina can mark you down. Click here for more information on La Cantina Restaurant. Keep your eye on the comments on this blog for any additional information or questions. CRAZY/SILLY/FUNNY Hat party, now for everyone!!! NEWSFLASH- Sept 19, 8:30AM PST- The Senior Bachelor Newsletter for Monday, September 19 just went out. Lots of details for Chicago!! I just received an email from Netflix because my movie, "Pop & Me," is available from them. I have been a member of Netflix for years and I REALLY LIKE the way their service works. This gave me a thought, along with the recent discussion on the blog about movies, that we should have a place on the Senior Bachelor website to discuss movies. I LOVE talking about how my son, Chris and I made the movie and how Hollywood works. In fact, I lecture about this at UCLA several times a year on this subject. In addition, Netflix is really, really affordable now. They have a special offer of $9.99 per month and they are giving ONE MONTH FREE if you sign up through the Senior Bachelor. So click on this link to sign up now and then we can start discussing movies in a couple of weeks.